On July 20th, 2014 the world’s best street riders meet up in Germany for the BMX STREET RINK. The list of riders is already packed with four heavy hitters! But there are some more guys out there who know how to drop jaws. 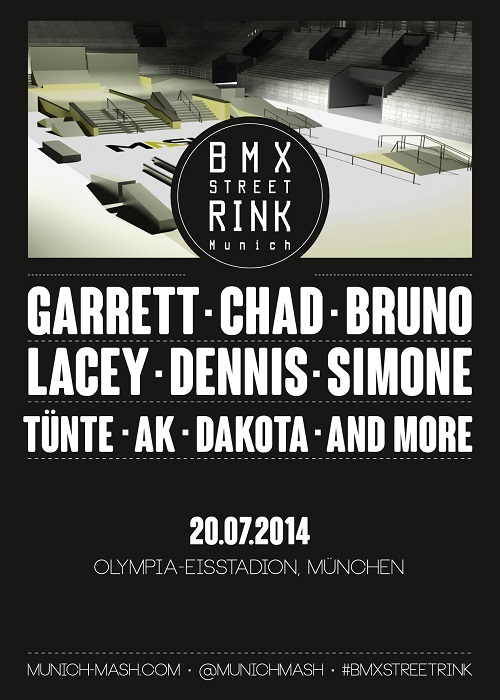 And they are coming to the BMX STREET RINK in Munich! Say “Servus” to Garrett Reynolds, Chad Kerley, Dan Lacey, Simone Barraco and Daniel Tünte! These five guys will join Bruno Hoffmann, Dennis Enarson, Dakota Roche and Alex Kennedy for the one of a kind contest in the historic ambience of the Olympic Park. So this is big news, right? Garrett Reynolds doesn’t really need any introduction. He won the NORA Cup for Number One Street Rider Of The Year – for the last six years! Garrett won X Games Gold in BMX Street – six times in a row. And his part in the “Deadline” video changed BMX – forever. Chad Kerley is the defending champion of BMX Street at X Games as well as BMX Streetstyle at Dew Tour. He took the 1st place at freedombmx magazine’s readers’ survey in the category International Rider Of The Year 2013 and now wants to impress his German fans in person. These two San Diego Locals will be joined by UK resident Dan Lacey. He is known for his “beast mode”, whether he’s riding in the streets or at contests. Another European rider at the BMX Street Rink will be Italy’s finest – Simone Barraco. The crowd-pleaser comes up with an original style and brings innovative tricks to every setup. Germany’s Daniel Tünte is one of the most versatile riders out there and learns new tricks within minutes. Can he make use of his home field advantage? We’ll see on July 20th at the Olympic Ice Stadium in Munich. So now we have 9 riders confirmed. There’s a national qualification contest the day before the BMX STREET RINK, where one spot is given to a local street rider. Six more invitations will be sent out to international pro riders. For further information and tickets check out www.munich-mash.com! This entry was posted in BMX, Land Sports, News and tagged 2014, BMX, BMX Riders, Street Rink. Bookmark the permalink.